In 2D mode the 3D-capable HDC-SDT750K has all the excellence that its HDC-TM700 camcorder cousin does. Both shoot in full 1080p, include a high-performance Leica Dicomar Lens and feature wide-angle capabilities and an 18x zoom. Best of all: both the HDC-SDT750K and HDC-TM700 shoot at 60 frames-per-second with progressive scanning. The majority of consumer camcorders shoot at 30 fps and use an inferior form of scanning, interlaced, which captures only a portion of each still frame. To view 3D video you’ll need a 3D-capable television. (Go figure). The HDC-SDT750K is especially calibrated to work with the Panasonic VIERA line. By happy coincidence, the VIERAs are the best 3D HD TV sets out there. The HDC-SDT750K produces quite good 3D video. Will watching 3D home movies of your new puppy give viewers the illusion that Sparky is jumping out of your television? No. But it will most definitely show Sparky rendered on your screen in three dimensions. 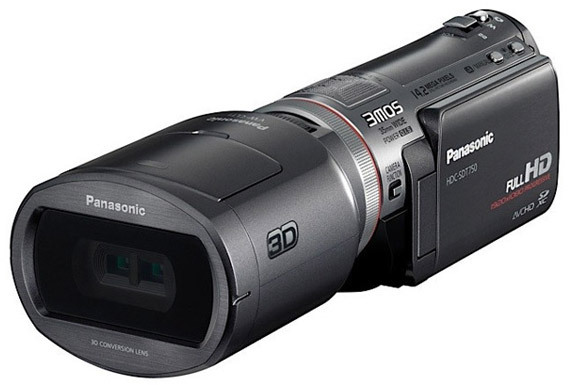 Panasonic makes 3D filming as easy as possible with this camcorder. Everything is automated that can be automated. And a clear set of instructions is included. Despite Panasonic’s best efforts (see above), filming in 3D is more tricky than 2D. You need lots of light, a focal range between 1.2 and 4 meters (4 and 13 feet) and so on. This is the fault of physics and 3D video technology in general rather than a fault of this camcorder in specific. Those with prior 3D videography experience will bemoan the lack of a robust manual 3D mode. Then again, almost no one falls into that category. 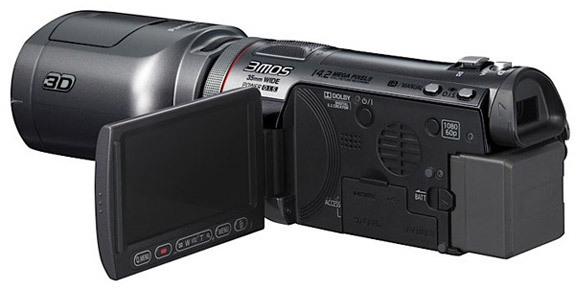 As with the 2D HDC-TM700 camcorder, the 3DHDC-SDT750K has an LCD screen that’s a little hard to see in sunlight. At three-inches across, the screen is also on the small size. The largest downside of all: the price. Though we expect Amazon to be offering a discount once production ramps up, a Panasonic HDC-SDT750K will currently set you back around US$1,400. Spot Cool Stuff is apparently among the few blogs that finds the Panasonic HDC-SDT750K to be more than a gimmicky fad gadget. Much more. We suspect that the majority of naysayers have never actually used this camcorder. Once you get the hang of capturing 3D video—a skill that admittedly can take a few hours to get decent at—it is rather amazing what you can do with that extra dimension. Kids, especially, tend to love it. Furthermore, we don’t think 3D in general is a fad. 3D Blu-ray movies are already coming out at a good clip. It makes sense that 3D consumer technology would follow. So, if money is little object to you then we wholly recommend Panasonic’s first consumer 3D camcorder. But what about for those who would have to stretch the budget to snag a HDC-SDT750? 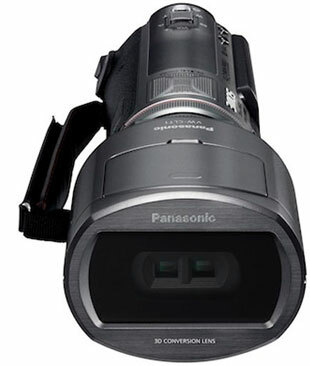 Amazon currently has a hidden price on the Panasonic HDC-TM700 of $755. That means adding 3D functionality essentially costs an extra $600. For serious videographers and early adaptors we think that $600 is worth it. If you are, say, expecting a new child and want to go crazy videotaping their first months of life then you might want to splurge on a HDC-SDT750 too. But for the rest of you, we suggest saving your money and opting for a superb, albeit limited to 2D, HDC-TM700. Panasonic was the first company to come out with a consumer 3D camcorder, but they certainly won’t be the last. « The Coming of the Transparent Airplane? OK, yes we are 3D addicts. We have the Samsung 58″ Plasma 8000 series 3D TV setup right down to dual Polk Audio twin 100w powered sub-woofers and 7.2, 1.4 pass thru amp. I thought that our 42″ Panasonic plasma generation 9 was as good as TV was going to get bought in 2006. However, when getting the new PN-C8000 I think is the model, we are blown away by the 2D and the 3D. Scrambling for 3d material it was natural to buy a camera. We pre-ordered the Aiptek only $200. We liked the 3D videos as they looked like coming from a much more expensive source. As fate would have it, the Aiptek didn’t survive the firmware update a week before our European vacation. Aiptek was great and said they would replace with new unit but 3 weeks turn around. So I had a discount coupon at Best Buy and they had a Fuji W3 3D in stock which we bought. As soon as I got it home, I saw a negative review (which always happens, no matter how good the reviews we see are great until we bring it home). An hour after bringing home, Amazon say you can have the Panasonic above in two days if purchase today. OK, what to do. I used the cheap Aiptek (well worth $200) and got hooked on filming 3D. We have a like new Canon higher end SX20IS which we love for 2D, stills and reasonable HD video. We also have a slightly used Panasonic HD Video camcorder which we don’t use much since getting the Canon. I read the Fuji W3 3D new camcorder manual from cover to cover and other then 1080 against 720 and 18x zoom against 3x, is it worth $1000 more. Plus the Fuji takes 2d stills with both lenses to make some interesting 2d wide and tele at the same time stills. So with the knowledge that the prices will come down on the Panasonic and the competitors will show nicer stuff for less we are going to keep the Fuji with it’s 3x zoom and a boat load of features and make do. Keep in mind the Fuji does quick nice stills and as 2d video which we haven’t tired yet. The articles we read said that the Fuji had features the new Sonys don’t and at over all is a much better value with plenty of goodies for today’s market. Hope this helps someone else who is on the fence. Don’t go without, at least buy the Aiptek with all 4 of it’s features and decent 3D video filming or if you don’t care about the extra $1000 for the Panasonic buy it. We are going to use the $1,000 on vacation stuff. ,Wish us well.